Description: NS 3563 - a B32-8, shares the burden with UP in Union, Nebraska. Description: NS L-89 heads west toward Goodman yard passing under the D street bridge on the Red Key secondary. Description: Home team is winning 9-1...yeah! Description: EB exiting the bridge over the Great Miami. Description: NS 202 with an NREX ex-C&NW SD50 in second. Description: NS 212's power has an exCNW second unit. Description: Two B32-8s an ex CNW SD50 and a GP60 lead this mixed freight into Allentown Yard. Description: NS 3563 waits at CP 88 to enter the yard. Description: A GP rebuild in progress ventures outside of the shop building. Description: An SW1500 moves a B32-8 and a GP rebuild around the shop. Description: This 4 legged gal pulls an m.t. autorack N/B. This was shot at a new cut for the double tracking effort. Description: NS 39J lead engine NS #8372 (Ex-Conrail #6150) at Harrison St. Description: NS 71J pulls by the junction with the former Algers, Winslow & Western. After they clear the switch, the train will back around the west leg of the wye and into the old AW&W yard. 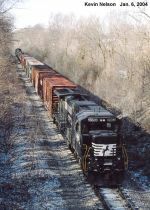 Description: Empty hoppers from LG&E's Cane Run Plant in Louisville head west across southern Indiana behind five 4-axles. The train is on its way to the former Algers, Winslow & Western where it will load. 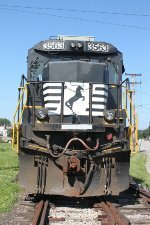 Description: Donated to the Lake Shore Railway Museum by Norfolk Southern, it has the distinct honor of being the very first Dash 8 locomotive to be preserved in a museum. Description: Looking like it is ready to roll down the rails again, it now sits in front of the Lake Shore Railway Museum depot. Title: NS 3563 Head On. Description: Thought this was a neat angle. Taken on Lake Shore Railway Historical Museum Property. Description: You know you're getting old when you see something like this at a museum! 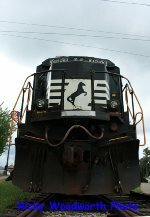 Description: Lake Shore Railway Museums latest aquisition, a Norfolk Southern B32-8!? I feel old now, gotta lay down. Description: NS 3563 (B32-8) at the Lake Shore Railway Historical Society and Museum in North East, PA.